The Lion continued, “However, once I’m gone, you will have to look after for yourself. You will find a different kind of animals. Always remember that you are strongest amongst them. Never be afraid of anyone- except a Human!” “Human?” asked the Cub. “Humans are extremely dangerous,” the Lion told his Cub.The Cub carefully listened to his father and promised to remember this life lesson. Also, read The Lion And The Camel. After a few days, the Lion died. The Cub developed a unique mentality for Humans. The Cub stayed in illusion and wished to meet a human being once in its life. 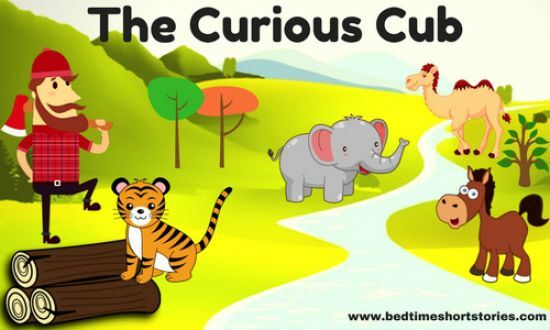 Due to its curiosity, the Cub went on to find a human being in the jungle. The Cub was left appalled on listening to the reply of the Horse. It asked the Horse in a surprising manner, “What? Human Beings ride on you?” “Yes, indeed!” the Horse replied. The Cub moved on after listening to the Horse. The Cub thought, “Human beings must be strong creatures!” You may also like to read, Story Of Woodcutter And His Good Deed. On this statement of the Cub, the Elephant laughed a lot. Then it replied to the Cub, “I’m an Elephant! Human beings are very clever. They compel me to dance in the circus by threatening to beat me with a rod.” “What did you say? Humans force you to dance by threatening to beat you with a rod?” asked the Cub. On hearing the Elephant, the Cub felt assured that human beings were dangerous. You may also like to read, The Lion And The Elephant. The Cub reached the edge of the jungle. There, the Cub noticed a man. The man was cutting woods through hammer and sickle. The Cub didn’t understand who was it. It went to the man and asked, “Have you ever seen a human being?” “Why do I need to see? I’m myself a human,” replied the man. The Cub was shocked to see the man as it never thought a human being would be so different than its image. The Cub laughingly replied to the man, “You are human? I thought human beings are small and dangerous. I can hunt you at this very moment.” On seeing the Cub approaching towards him, the man used his intellect, “Stop! If you think you are stronger than me then try to remove this sickle from wood,” said the man. The Cub put one of his hands in the gap and removed the sickle from the other. As soon as the Cub removed the sickle, the gap got closed and its hand got stuck. The Cub screamed out loud, “Oh, lord! It’s so painful! Save me!” The Cub realized its mistake and it said to the man, “Please, forgive me! I have understood that human beings are very intelligent. I promise that I will never confront a human being ever again!” On listening to this, the man removed the Cub’s hand and the Cub ran away into the jungle. Also, read The Horse And The Donkey. MORAL OF ANIMAL MORAL STORIES FOR KIDS: WE MUST ALWAYS FOLLOW THE ADVICE OF OUR PARENTS.